The opening scene of The Gallows shows promise. We watch through the lens of a camcorder as a Crucible-esque school play is reaching its climax, in which the lead character is to be hanged. The main actor steps up to the gallows and places the noose around his neck, when suddenly the set malfunctions, the platform below him opens, and he is accidentally hanged. Like, for real. It’s actually quite jarring, and despite the fact that no school production would ever employ a fully functioning gallows, let alone place a noose around a student’s neck, it sets the tone for what could be a decent funhouse shocker. Fast forward twenty years and the same high school is determined to revive the doomed production in … um … honor of the tragedy. Because that’s also something a school would do, right? Whatever. Anywho, since this school exists in bizarro world, it’s only fitting that the drama program is completely mandatory, which is why the lead actor in the play is also one of the stars of the football team. He’s a jock, and jocks rank above theater nerds in the high school hierarchy, so it’s easy for theater-jock’s utterly obnoxious friend to convince him to break into the school at night and destroy the set in an effort to end the production. Since this is a found footage movie, the teens have decided to film their little prank (see: felony), and then ghosts happen. When done correctly, the found footage format is a way to evoke tension on a meager budget. When done poorly, it’s a lazy way to make a movie without actually making a movie. Sadly, the latter is the case for The Gallows. Presented as “property of the so- and-so police department,” the film is mostly successful in committing to the found footage format, and even manages to justify the omnipresent camera (it’s the only light source the characters have). What isn’t explained is why the police department would edit false jump scares into their evidence, or why there would even be a first act, let alone a punishingly long one. The Gallows takes so long to set up and is populated with such unlikeable characters that by the time the carnage gets underway, relief trumps fear. Not that a beefy first act is a bad thing – a slow burn can be a powerful tool in a horror film – but when it ultimately doesn’t lead to anything, it’s just a waste of time. And could the foreshadowing be any more obvious? Seriously, if at any point you are surprised by one of the lame revelations, congratulations on watching your first movie. There are a few moments which are startling by design. Viewers will surely jump in their seat, but that’s all. There’s plenty to react to but nothing to be scared of. No dread. No lingering thoughts to keep you up at night. Just decently well-designed bursts of sound coupled with creepy imagery. So on that purely basic level it works. Otherwise, it’s one of the lower rung POV horror films around. What’s most upsetting is that under all the faux-stylistic muck, there’s a scary story to be told. Throw away the found footage aspect and flesh out the characters, and you might have yourself a pretty wild horror movie. As it is, it’s pretty weak. 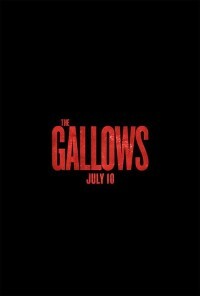 The Gallows opens today in Philly area theaters.